My first startup wasn't a business. It wasn't a product. It was a sports team. There is something fascinating about creating something out of nothing. 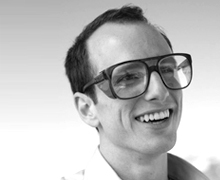 We spoke with Airbnb co-founder Joe Gebbia about what drew him to design, lessons learned at art school, and the experiences that prepared him for Airbnb. Joe, like many of our contributors, made his way to design through fine arts. He wanted to be a painter. Encouraging parents, high school art classes, and a summer art camp were pivotal moments that led Joe to decide to pursue painting at Rhode Island School of Design (RISD). He said, “I wanted to do something as an artist that was so significant, so visually arresting, and so truly innovative that art historians would have to put in an art history book.” When Joe got to RISD he discovered other disciplines, such as design, and quickly decided to take a different path. He said, “I learned about people like the Eames, whose goal was: ‘Create the best for the most for the least,’ and I realized that design could touch millions of lives. This to me had much more impact then painting one canvas.” Joe’s motivation (the same motivation that allowed him to aim for the history books) led him to double major in industrial and graphic design, and to launch his first startup—the RISD basketball team. Joe’s experience at RISD taught him design skills and design thinking but it also taught him the basics of entrepreneurship. His startup ventures didn’t stop with the basketball team, his next pursuit came out of an idea he had his freshman year. After going through the physical (and emotional) anguish of an 8+ hour design critique, he noticed that everyone had to sit on uncomfortable and dirty surfaces in the studio. He immediately drew a sketch of a seat cushion (inspired by the seat of our pants) and aptly named it: Crit Buns. Four years later, and some design skills under his belt, he designed, produced, and marketed the cushion, and started a company the day after he graduated. The road for Crit Buns wasn’t easy, and many retailers flat out rejected him. He eventually made his first sale to a small store in Providence: a total of four cushions. For Joe, those four cushions were enough because for the first time he was able to see an idea go all the way from his sketchbook to the shelf. The confidence he gained from that first sale allowed him to push past the rejection and Crit Buns made it from the shelf in Providence to the MOMA bookstore in NY, in just two years time. His next startup would be his biggest yet—that of course, is Airbnb. The basketball team and Crit Buns emotionally prepared him for what was to come. He said,”Airbnb has had all the extremes you can imagine. The greatest successes and the greatest failures.” The founders, Joe, Brian Chesky, and Nathan Blecharczyk took on personal debt, faced rejection from investors who thought their idea was crazy, and kept going through unsuccessful launches. They persevered and in 2011, three years after they launched, the company received $112 million in funding. Airbnb gives hosts the ability to rent their extra space, and guests a unique experience to remember. In a way, Airbnb has achieved the Eames’ motto of giving back to a lot of people (5 million total bookings as of February 2012), and does it in a way that both saves people money and gives them richer experiences. Joe took advantage of opportunities in front of him, he solved problems that he experienced, learned from the ups and downs, and used those experiences to guide Airbnb. Whether your next venture is starting a basketball team, or launching the next great startup—you can learn from Joe’s perseverance and dedication.